Over one hundred dollars in groceries and I didn't get ketchup or catsup. I use it rarely. I don't know how long the bottle just finished was in the fridge for. While I had to wait for my hair cut, I dashed over to Dominicks to get ketchup. I usually buy what's on sale but this time, I looked at the ingredients. I'm sure I heard that high fructose corn syrup was in ketchup but it wasn't until I looked at the ingredient list that it was real to me. Why do I want Karo syrup (that's what it is, really) in my ketchup again? So, I bought organic. Remember this is going to sit in my fridge for awhile. 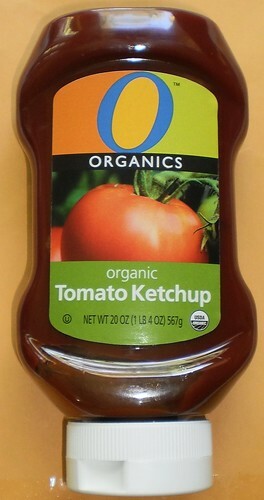 That makes organic ketchup as cost effective for me as any other. Now to make bacon cheeseburgers. In addition to the sweetness it's in there to shelf-stabilize it so it can sit out without refrigeration.